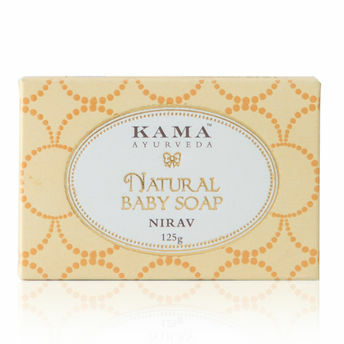 Kama Ayurveda’s Natural Baby Soap is made in Ayurvedic formulation to gently cleanse and nourished the delicate baby's skin. It is gentle and fragrance free soap blend in Organic Coconut oil, Castor Oil and Sun Flower oil. This Natural baby soap is made with Turmeric and Cedar wood extracts which are also an anti-septic and anti-bacterial, these powerful ingredients works as a guard fragile to protect the skin from germs, toxins and any environmental pollutions. It also calms the inflamed and sensitive skin.Milk which is truly a wholesome moisturizer, rich with many vital nutrients and vitamins keeps the skin nourished and hydrated. Using this creamy natural soap helps to repair the skin roughness and rashes & keep the baby skin soft, smooth and healthy all day long. Protect the skin from germs. Hydrates and nourishes the baby skin. Explore the entire range of Bath Time available on Nykaa. Shop more Kama Ayurveda products here.You can browse through the complete world of Kama Ayurveda Bath Time .